Mr and Mrs McMahon’s love for VW’s will never die; they love the freedom and simplicity that comes with van life. 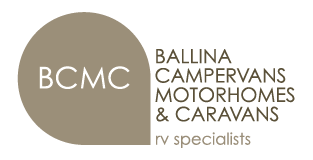 It all started back in 2007, when David McMahon and his wife Bev kept passing Ballina Campervan & Motorhome Centre, specialised dealer of campervans and motorhomes, on their travels north and when coming back down the coast to their home in Taree. They didn’t have a lot of money but were keen to purchase their first campervan, which would become the first of many. So, they went with the cheapest option, a Toyota Hiace Frontline Campervan, which they purchased from Clayton Kearney and his team at BCMC. As a family of four, with two kids (now aged 34 and 42), they no longer liked towing caravans and weren’t keen on tents, due to running into several issues including their tent catching on fire and a caravan leaking in the rain. As the kids were getting older they were becoming more interested in the campervan lifestyle for two. During the time of owning the Toyota, they still held a keen eye for Volkswagen campervans, mainly because they wanted more space and the ability to walk from one end to the other. After two years it came time to upgrade their van. 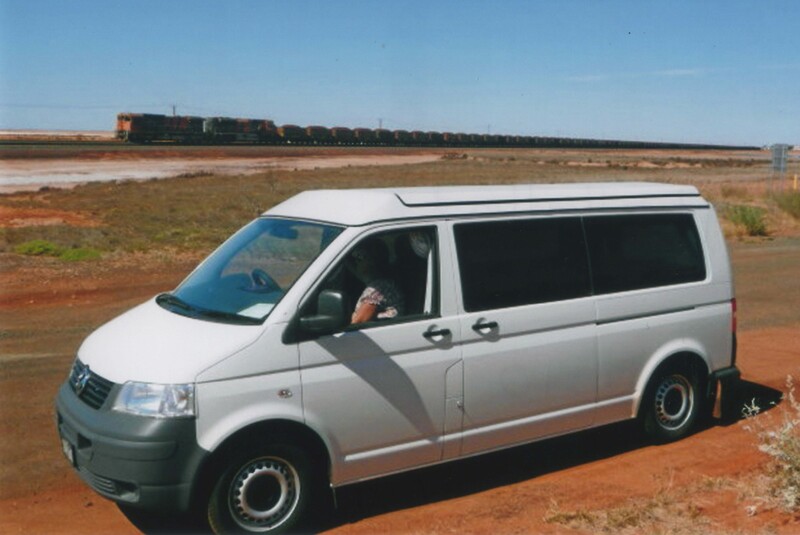 In 2009, when the couple were getting close to retirement, they purchased their first Frontline VW Transporter Campervan. What they loved most about the VW van was the space and it didn’t need much in the way of customisation, additional extras or features; we just needed a vehicle that would suit the two of us. If they ever need their space from one another, they would go their separate ways – Bev would head to the movies, while Dave would catch a wave. Or if Bev wanted space to stay in the van, David would head off for a pushbike. However, majority of the time the couple live comfortably together in the comforts of their van. Being active has also always helped David and his wife to continue enjoying their time on road and the outdoor lifestyle that comes with it. On David and Bev’s travels in 2009, they travelled around Australia from Taree, to Port Headland in W.A and then on to Karijini National Park. Along the way they saw many sites on the road that otherwise they would never have experienced. In 2010 Volkswagen enhanced the T5 with some great improvements, with changes to the steering wheel, stereo and air conditioning. One of the impressive features is the swivel seat and walk through cabin, which is transformed into a clever use of additional space. This year, their mileage was getting up over the 100,000km mark and they wanted to trade this vehicle in for a newer model. Over the past 8 years with BCMC, they had built a very strong relationship and were so grateful for their support and help. “We’ve known them for a long time now. We could head to Sydney but we have got to know Clayton very well, we can trade vehicles, they have friendly service and it’s only a three-hour drive for us. So we called back into the showroom in Ballina and found our new vehicle, the 2015 Frontline VW Transporter, Avalon in white. 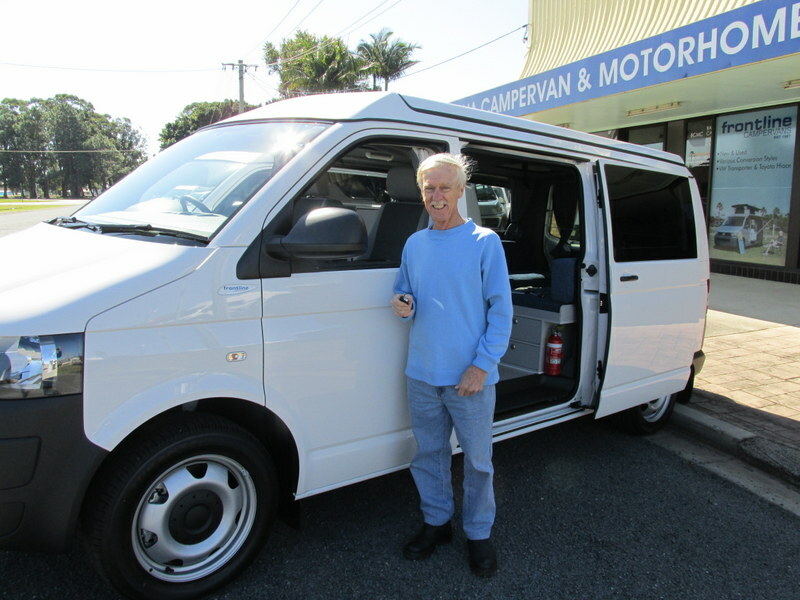 The 2015 van was the very last one left in Australia and it was a T5 model with no mileage and an Freedom fit out. This vehicle had lots of space, we brought the back up for storage so we have the ability to sit inside the vehicle and read the paper and relax and we only need one port for our clothing. We also heard there’s a 2016 model coming out on the market, the new T6, but knowing the motor is no different just the cosmetic appearance. David McMahon, VW owner and Mark from BCMC handing over the keys. 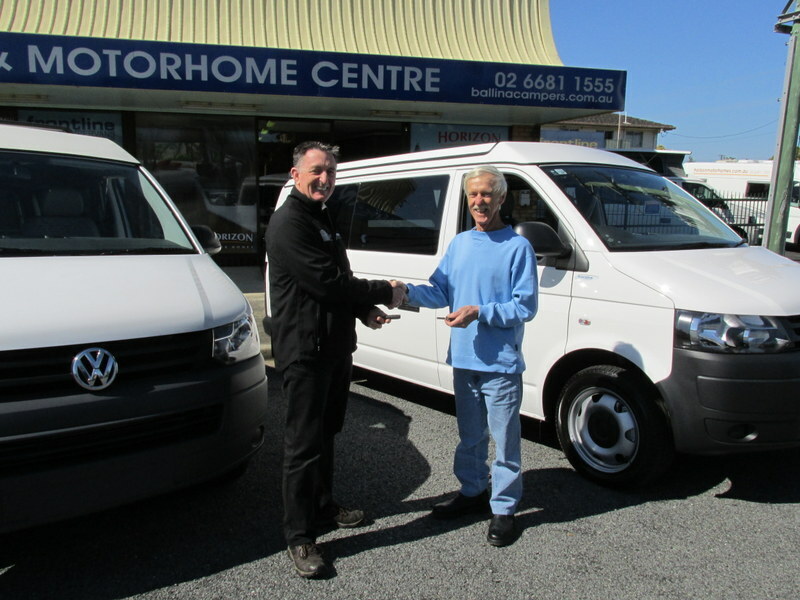 David McMahon and his new 2015 Frontline VW Transporter and the last on the market. – David and Bev McMahon of Taree, August 2015.